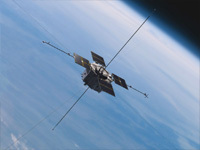 The Van Allen Probes deploy their solar arrays. 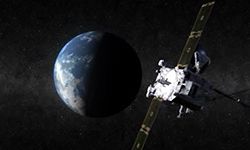 The Van Allen Probes will orbit Earth on similar orbits, ranging from approximately 373 miles (600 km) to 23,000 miles (37,000 km) altitude. A Van Allen Probe deploys the spin plane booms that carry instruments for the Electric Field Wave experiment. A Van Allen Probe deploys the stacer booms that hold instruments for the Electric Field Wave experiment. 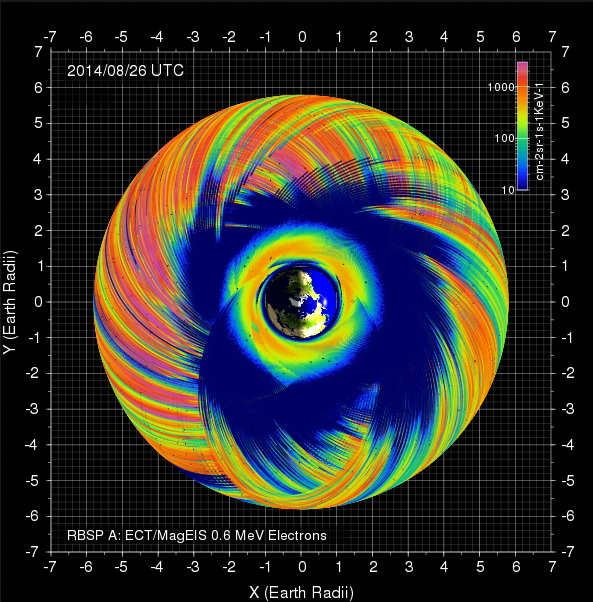 This is an animated model of the varied response of the outer radiation belt to geomagnetic activity. A coronal mass ejection erupts from the Sun, hurtles towards Earth, and interacts with Earth's magnetosphere. This is a demonstration of the motion of a charged particle in the Earth's magnetic field as it gyrates around the field lines, bounces from pole to pole, and drifts around the Earth. The dual-payload attach fitting - the mechanism used to hold the TIMED and Jason-1 spacecraft in place during launch - separates in preparation for the TIMED spacecraft to be jettisoned from the Delta II launch vehicle. 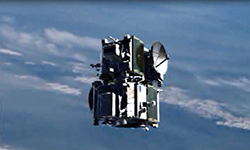 TIMED is the second of the two spacecraft to be jettisoned. 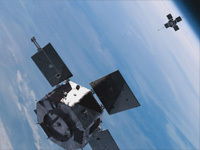 Within seconds after its separation, TIMED's solar arrays are deployed and the spacecraft begins detumbling - an action that occurs during the course of one orbit cycle to help stabilize the spacecraft. Note: You will need special software to view these files. If you do not already have QuickTime installed, you can download it from www.quicktime.com. Microsoft's MediaPlayer can be used to view MPEG files. Additional MPEG players can be found at www.mpeg.org. 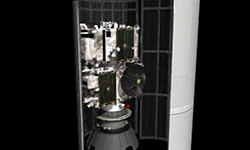 A spacecraft separation system allows one STEREO observatory to sit atop the other within the third stage of the Delta II launch vehicle. STEREO mission designers determined that the most efficient and cost-effective way to get the twin observatories into space was to launch them aboard a single rocket and use lunar swingbys to place them into their respective orbits. 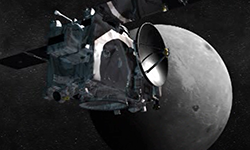 This is the first time lunar swingbys have been used to manipulate orbits of more than one spacecraft. Mission designers will use the moon's gravity to redirect the observatories to their appropriate orbits - something the launch vehicle alone can't do. After launch, the observatories will fly in an orbit from a point close to Earth to one that extends just beyond the moon. 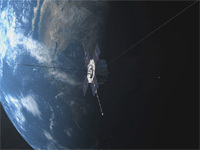 Approximately two months later, mission operations personnel at the Johns Hopkins University Applied Physics Laboratory (APL), in Laurel, Md., will synchronize spacecraft orbits, directing one observatory to its position trailing Earth in its orbit. Approximately one month later, the second observatory will be redirected to its position ahead of Earth. The twin observatories will fly as mirror images of each other to obtain unique "stereo" views of the sun's activities. They must be placed into a rather challenging orbit where they're offset from one another. One observatory will be placed ahead of Earth in its orbit around the sun and the other behind. Just as the slight offset between your eyes provides you with depth perception, this placement will allow the STEREO ob­servatories to obtain 3-D images and particle measurements of the sun. Each twin STEREO observatory will carry two instruments and two instrument suites. This combination provides a total of 16 instruments per observatory. APL is designing and building the spacecraft platform housing the instruments. 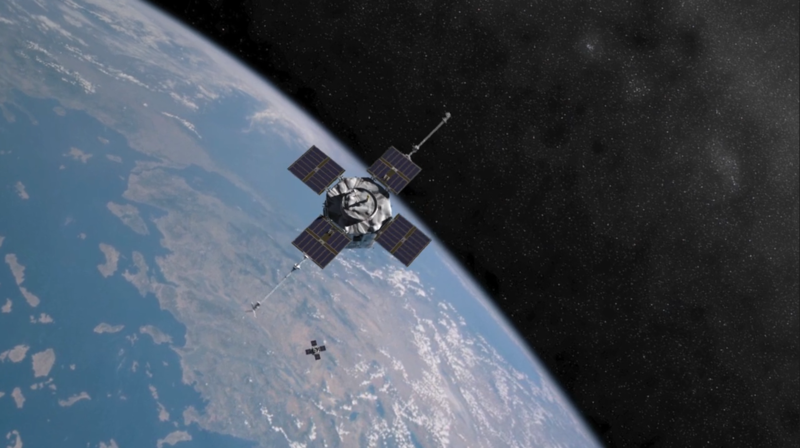 When combined with data from observatories on the ground or in low-Earth orbit, STEREO's data will allow scientists to track the buildup and liftoff of magnetic energy from the sun and the trajectory of Earth-bound coronal mass ejections in 3-D.